How to Get Rid of Dark Gums? A hundred per cent beautiful perfect smile is appreciated only when there is a good set of properly aligned teeth associated with even, pinkish gum line showcasing them. We often see people around us feeling embarrassed to smile wholeheartedly in the public gatherings. There may be many reasons for that which might include mal-positioned teeth, uneven gum line, discoloured teeth etc. Also, some people feel inconvenient in showing off their dark gums. YES!! dark gums and its solution is the topic for today’s discussion. Gum is the tissue covering the necks of teeth and bone in which teeth are fixed. The color of healthy gums in India is pale red to pink. Of course, this color will be darker in dark-skinned individuals especially in African countries. Imagine dark gums in a white skinned or fair skinned individual. This will be really embarrassing for an individual to smile. 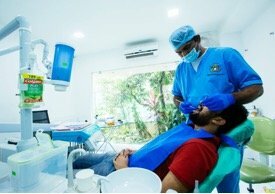 Here at The Dental Specialists we provide a wide range of gum treatments options for dark gums and similar problems with the latest and advanced technology like lasers, helping you achieve your “Dream Smile”. Where does this darkness come from? Dark or black complexion will be caused by melanocytes. Melanocytes are a type of cells which produce melanin pigment which is usually brownish black in color. If the number of melanocytes increases more than the normal limits, the complexion changes to black. Why do gums become dark? Is it harmful to have a dark gum? If the complexion of gum is always been dark then it is of no harm, but if any patches tend to develop overtime then we need to consider that there is something wrong. Using scalpels – the outer surface will be scrapped. With scalpels, the bleeding and trauma will be more as well as healing will also be prolonged. Note: In the case of smokers, by quitting smoking the gum color can be regained. It is reversible. In the case of old silver fillings and metal crowns, if we replace them the original color can be retrieved. If the procedure is done with scalpels more healing time required. If done with advanced laser therapy the bleeding, time taken for the procedure and the postoperative care will also be minimal. The postoperative care includes being gentle on gum, regular brushing, flossing and rinsing. Avoid eating hot and hard foods for a while. 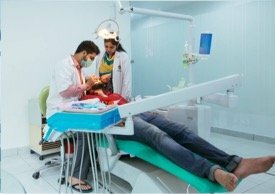 How much time is required for the total procedure? The time taken would be around 30-45 minutes for each sitting. If the pigments remnants/spots are seen in review check-up, another sitting will be advised. Who are the candidates for gum de-pigmentation procedure? Individuals healthy gums with sufficient thickness are ideal candidates for gum de-pigmentation.